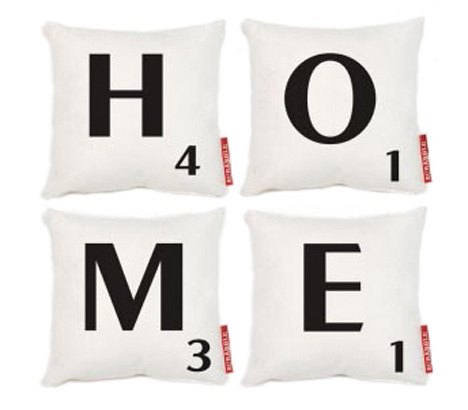 Pillows and cushions are more than just a place to lie your head or a thing to turn over when you spill cheese dip. They are the things you hold onto during a scary movie, the objects you bury your face in during a crying fit, and the perfect weapons for pillow fights. 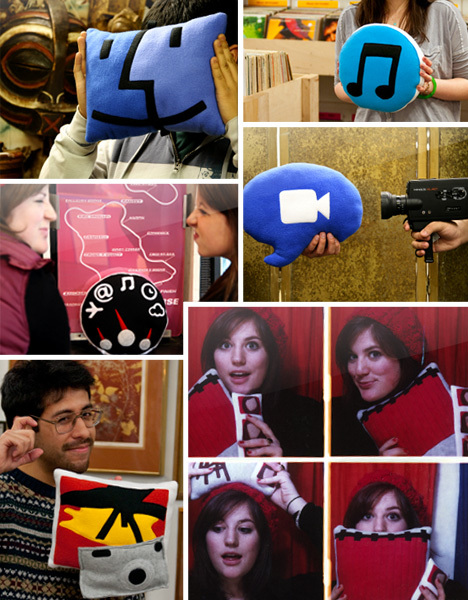 They are an essential part of home decor that let you express your personality. And there’s no reason they have to be square and boring, as these incredible examples prove. Whether you are in school or working a desk job, you know the feeling: the heavy eyes, droopy head, and the inevitable desk nap. It can be embarrassing when you get called out for it, but even more embarrassing when you wake up with a bunch of paper clips stuck to your forehead. 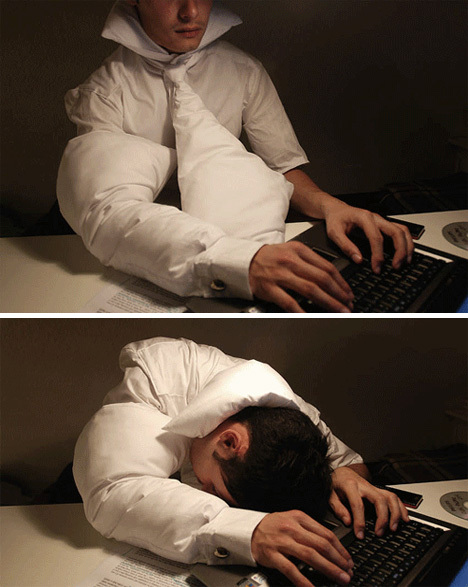 The Pillows For Working Late consist of a soft pillowy collar, necktie, and sleeve that will make you look very goofy but provide a soft place for your head no matter which way it lolls. If you really can’t resist a nap and need to take a little power nap to recharge, the iSleep can help you out. 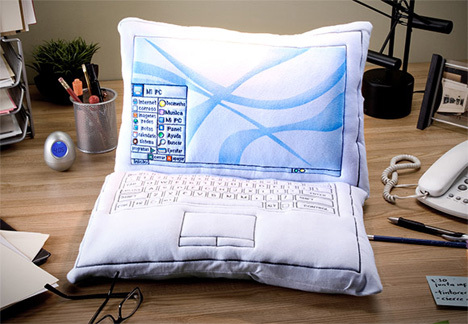 It attaches to the top of any notebook computer, and when you close the lid the pillow fills with warm air from the computer’s exhaust. Ten minutes later, an alarm lets you know that naptime is over and you need to get back to the grind. 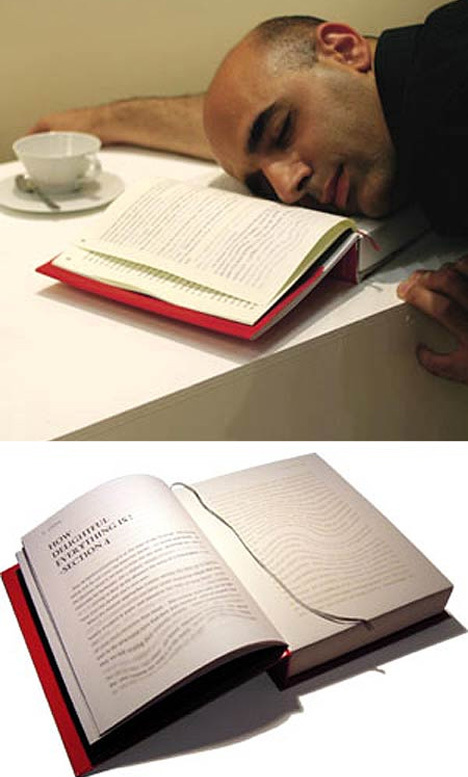 Another clever way to nap at your desk but make it look like you have been doing something productive is the Book Pillow. It looks just like a real book other than the weird swirly text – but no one will see the text anyway once you’re lying down and snoozing your study or work time away. 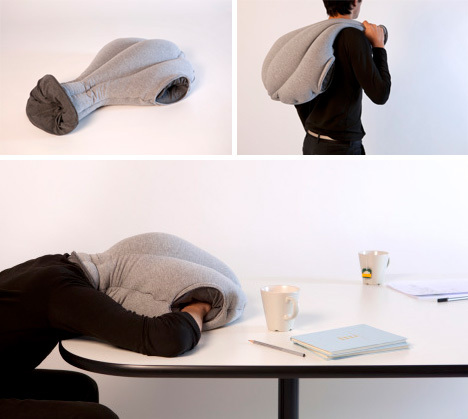 When you just give up all pretenses and decide to take a full-on nap in the breakroom, the Ostrich Pillow can be your best friend. It encloses your head to block out light and sound and keeps your hands nice and toasty while you recharge with a few quick Zs. 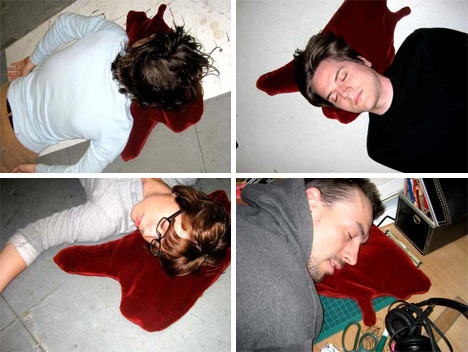 While maybe not to everyone’s taste, these blood puddle pillows sure to make a striking visual impact. The soft red velvet takes the shape of a pool of blood, making light of the split second of panic we’ve all experienced when a loved one is sleeping a little too deeply. 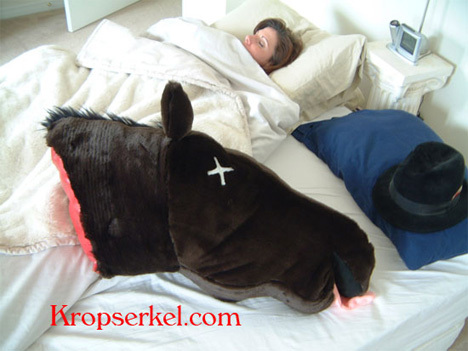 If you feel the need to get back at your beloved for sleeping on a blood puddle pillow and scaring you half to death, the Horse Head Pillow would be one way to do it. The attention to detail on this macabre cushion is impressive, from its bloody neck stump to its protruding tongue. 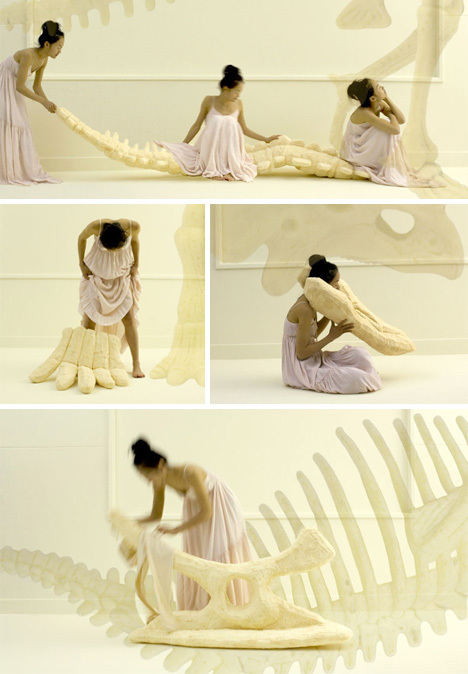 Although perhaps not comfy enough for sleeping on, these dinosaur bone cushions made of rubber-coated foam look like great fun to play with. What rolls down stairs, alone or in pairs, rolls over your neighbor’s dog? Not this log, because it’s a light-as-air pillow! 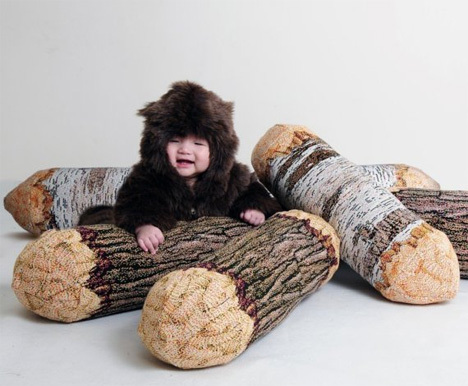 These sweet bolster pillows look like trees that have been gnawed by beavers, but they’re really just a playground for this adorable little baby (baby not included). There always seems to be at least one intolerably uncomfortable spot on every couch – but that is certainly not the case with the Cushionized Sofa. 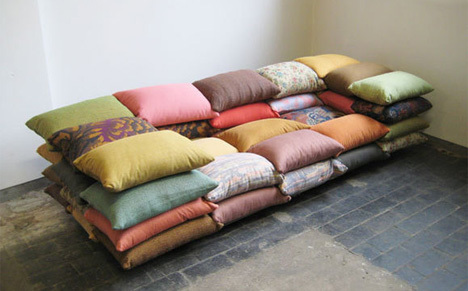 It’s a sofa built of a metal frame and entirely covered in soft pillows. We can’t imagine a better napping spot. 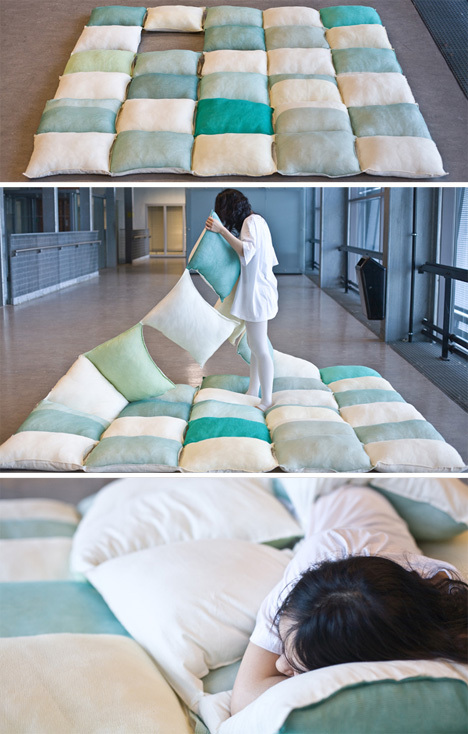 When you sleep on your sofa made of cushions, this blanket made of pillows would be quite appropriate. Made of lots of pillows securely attached, the Pillow Blanket looks insanely soft. One pillow is missing from the grid pattern so that you can use the entire thing as a blanket while sticking your head up through that hole to use it as a pillow also. The soup can safe was pretty ingenious…at first. And then everyone had them, and then everyone’s kids started giving away untold riches to food drives because they didn’t know better. Or at least that’s what a chain email told us. 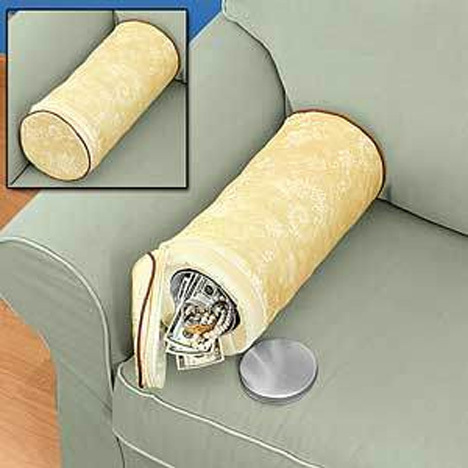 Luckily, the sofa cushion safe can hide away your cash, documents and valuables right under everyone’s noses. Just don’t ever leave the couch, because this cushion safe doesn’t appear to have a locking mechanism other than a small zipper. Insomniacs and chronic stress sufferers are in dire need of something to calm them down and ease the tension. 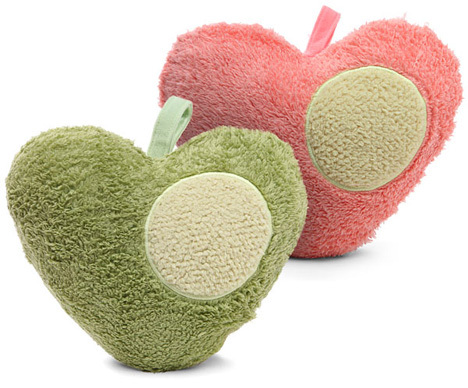 The Beating Heart Stress Relief Pillow is a great place to start. 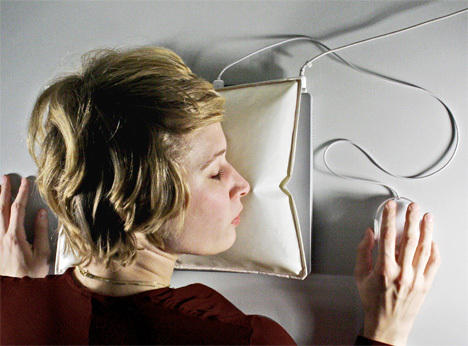 The pillow emits a heartbeat that your own heartbeat eventually syncs to, resulting in a feeling of calm. The rhythm of the heartbeat is different every time you use the pillow so it doesn’t sound fake or predictable. Sleeping alone is great for some people, but others just can’t feel comfortable without the arm of their loved one around them. When that isn’t possible, some people go to extraordinary lengths, like buying a boyfriend arm pillow. The pillow has a soft but firm arm into which you can nestle while drifting off. For those who prefer a feminine touch, there is also a female version available. Have you ever taken your favorite pillow on vacation because you just couldn’t sleep without it? 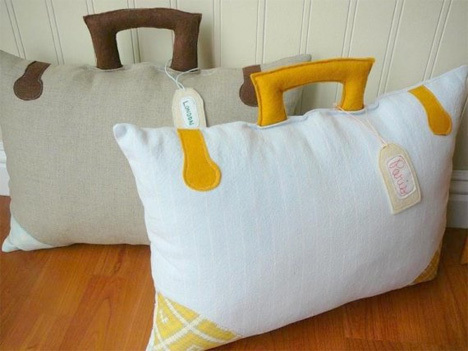 These cute suitcase pillows are meant to travel with you via a small handle on top. For added cute, there is even a luggage tag attached. The moon is sort of the unofficial mascot of sleeping, so making a pillow in its shape seems logical. 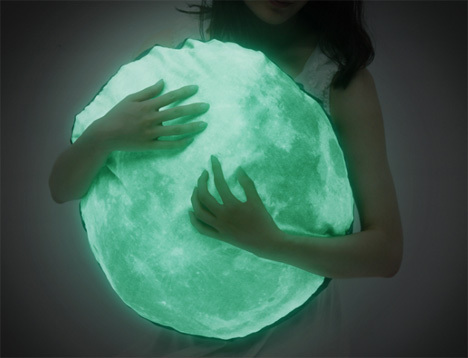 This lovely rendition of the moon glows softly in the dark, guiding you gently to your bed. 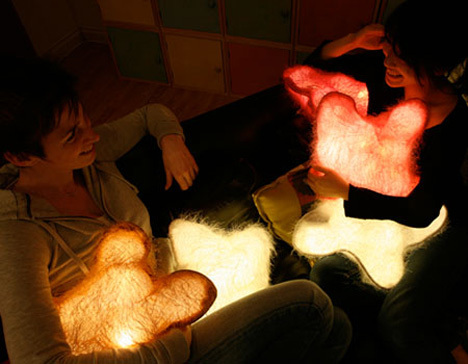 The huggable D-Light pillows are a combination cushion and nightlight. They will stay lit for up to four hours at a time, but we bet that with such a fuzzy soft pillow in your arms you wouldn’t need nearly that much time to fall asleep. For the TV lover who already has everything, the Pillow Remote Control is probably a gadget they don’t have quite yet. 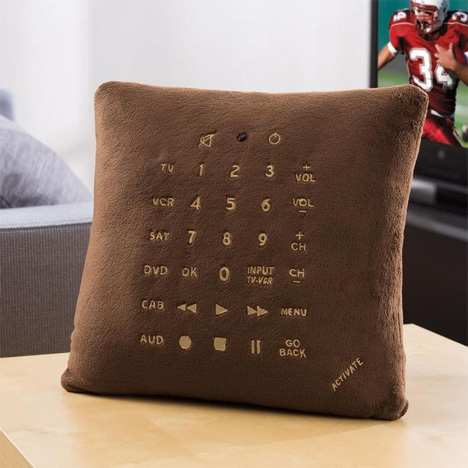 Just like the name says, it’s a pillow…and a remote control. Just don’t fall asleep on it or you’ll end up listening to some crazy Estonian infomercial. People who are really, really attached to their video games can now take that obsession a little further. 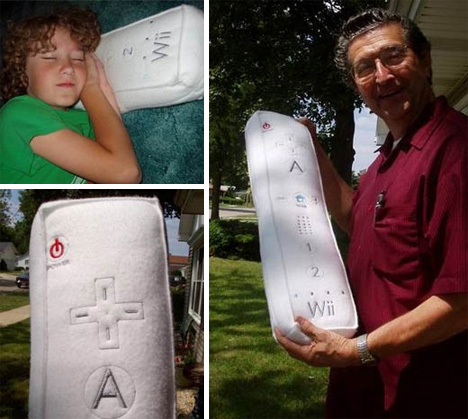 The enticing NES and Wii-mote cushions would no doubt inspire dreams of goombas and fire flowers. How many points do you get for playing S-L-E-E-P-Y in Scrabble? 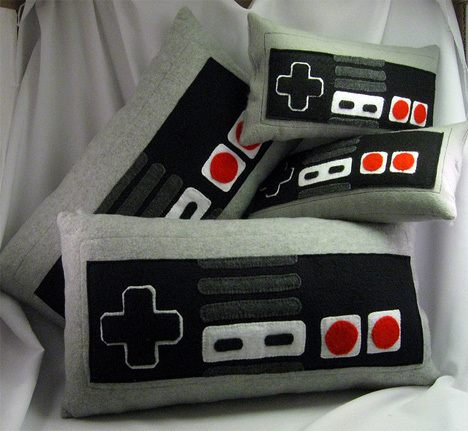 These fun cushions based on the classic game could tell you. Made for a Pepsi commercial, this laptop pillow has never been available for purchase…but that doesn’t stop us from fantasizing about how soft and comfy that keyboard looks. 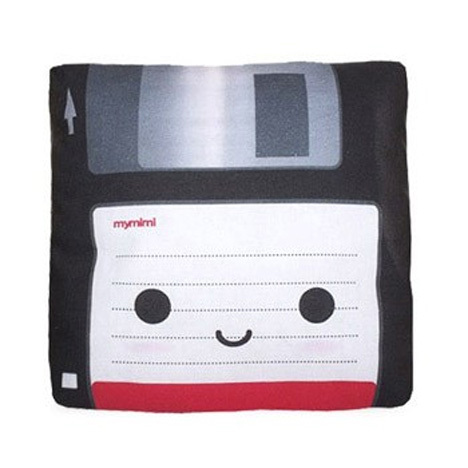 If the laptop pillow above were real (and a time traveler from a time when floppy disks were used), it might be friends with this way-too-adorable friendly floppy disk cushion. The two previous cushions would definitely want to partner up with the DOS pillow for any operations they might be planning to execute. 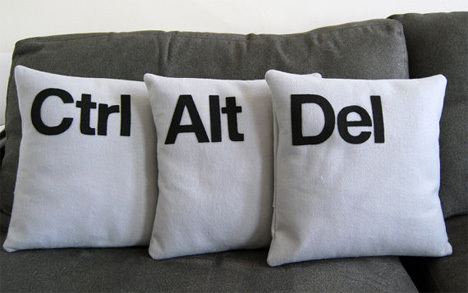 As always, the magical CTRL + ALT + DEL combination could help you get out of a jam…like the dire need for a nap. Emoticons, or smileys, are still going stronger than ever, despite hopes from almost 20 years ago that they would quietly go away eventually. These miniature smiley pillows come in American or Asian versions, and they are all pretty adorable. Digital designers know this warning sign well: it means your printer is about to run out of a certain color, probably much sooner than you expected. 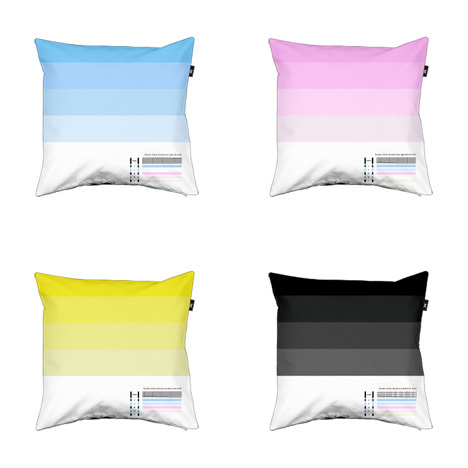 Rather than stage a coup against the printer industry, designer Thomas Dabner decided instead to make up these fun CMYK cushions. Designers will also recognize these colorful icons right away. They are 3D versions of the Adobe CS icons that artsy-type people work with every day…and can now see even in their dreams! Apple products have always been known for their user-friendly intuitive interfaces. 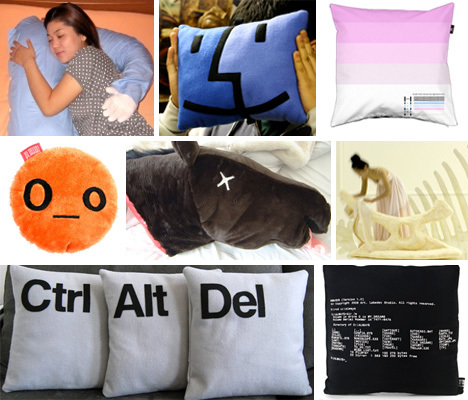 This set of pillows celebrates some of those, er, iconic icons that Mac users see every day. 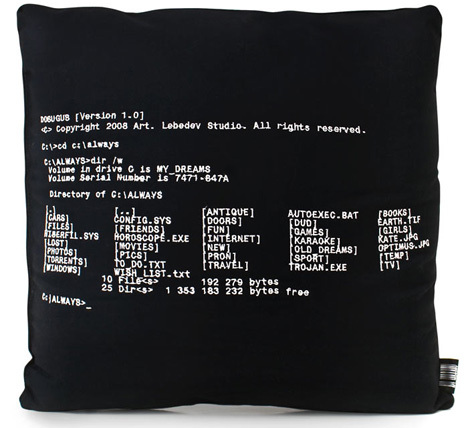 The same store that brought you the Mac OSX cushions also have a pretty comprehensive set of pithy txt spk cushions as well. They have the benefit of being shaped like little speech bubbles so you can bring your lazy abbreviations into real life. 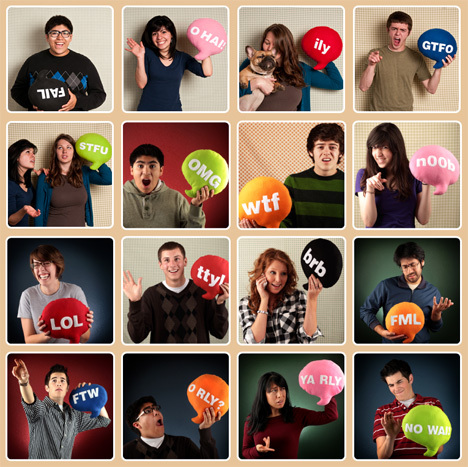 Many of us tend to have a sort of love/hate relationship with social media sites. 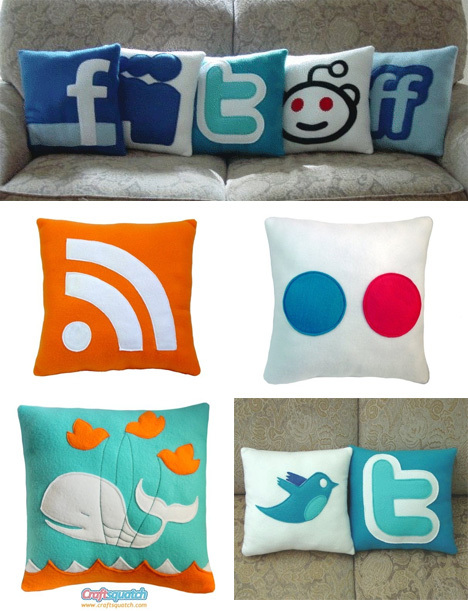 These pillows, all from Etsy seller Craftsquatch, will let you hug or hurl your favorite social media site whenever the situation calls for it.